LOS ANGELES, California, November 17, 2011 (ENS) – The Honda Civic Natural Gas was named the 2012 Green Car of the Year at a press conference Thursday during the Los Angeles Auto Show’s press days. As the only assembly-line produced natural gas passenger model manufactured for sale in the United States, the Honda Civic Natural Gas is powered by the cleanest running internal combustion vehicle certified by the U.S. EPA. “There is no other vehicle like the Civic Natural Gas on American highways, and this recognition has been a long time coming for Honda,” said Ron Cogan, editor and publisher of “Green Car Journal,” which offers the award. 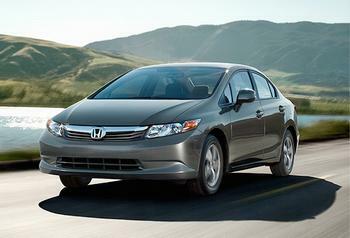 “After manufacturing this environmentally conscious model for fleets since its introduction in 1998, Honda has now made a major commitment to bring its exceptional, American-built natural gas sedan to everyday buyers, offering an all-new array of popular consumer-oriented features and availability through 200 Honda dealers in 36 states,” said Cogan. “The Honda Civic Natural Gas, is a prime example of an alternative fuel that is viable, efficient and practical, making it worthy of the 2012 Green Car of the Year award,” he said. Natural gas is a clean-burning fuel found in abundance in the United States, which gives the Civic Natural Gas a low tailpipe emissions levels untouchable by any other internal combustion production vehicle. Rated at 38 highway miles per gallon equivalent, the Honda Civic Natural Gas is an advanced technology partial zero emissions vehicle and also features Eco Assist and a selectable ECON feature to enhance the vehicle’s environmental efficiency. Along with fast-fills in about five minutes at stations offering natural gas, the Civic Natural Gas can be time-filled at home overnight with an available wall-mount refueling appliance from BRC Fuel Maker. The Civic Natural Gas can drive about 240 miles on a tankful of compressed natural gas, almost two-and-a-half times the range of a typical electric vehicle. “The Civic Natural Gas is not only a great vehicle, it also demonstrates Honda’s commitment to provide a variety of alternatives to gasoline,” said Michael Accavitti, vice president of marketing at American Honda Motor Co., Inc. The Green Car of the Year jury, comprised of six environmental and automotive experts along with “Green Car Journal” editors, includes: Carl Pope, chairman of the Sierra Club; Frances Beinecke, president of the Natural Resources Defense Council; Jean-Michel Cousteau, president of Ocean Futures Society, and Matt Petersen, president of Global Green USA. Rounding out the jury were Jay Leno, noted auto enthusiast and host of “The Tonight Show,” as well as Carroll Shelby, the American retired automotive designer and racing driver, best known for making the Ford Mustang. They selected the 2012 Honda Civic Natural Gas from a field of five finalists that also included the Ford Focus Electric, Mitsubishi i, Toyota Prius v and Volkswagen Passat TDI. Also Thursday at the Los Angeles Auto Show, Ford Motor Company was declared the winner of the 2nd annual Nielsen Automotive Green Marketer of the Year. Offered by the New York-based information and measurements company Nielsen, the award recognizes the brand that made the greatest strides in gaining consumer awareness and positively impacting consumer perceptions of the automotive industry’s environmentally friendly initiatives. Auto manufacturers that ran any national TV ads with green themes between October 2010 and September 2011 were eligible for consideration. Ford was honored for its successful ad campaigns embedding MPG messaging. This effort coupled with campaigns featuring real people helped to increase positive consumer opinions and purchase consideration for the brand. Ford’s ad campaigns also helped drive positive online sentiment, with three in 10 green-themed online discussions reflecting favorably on Ford. The Nielsen Automotive Green Marketer of the Year Award recognizes the brand that made the greatest strides in gaining consumer awareness and positively shifting consumer perceptions for the automotive industry’s environmentally friendly initiatives. Other finalists for the award included Chevrolet, Ford, Honda, Toyota and Hyundai. As the first major North American auto show of the season, the 2011 Los Angeles International Auto Show will host approximately 50 World and North American debuts at the Los Angeles Convention Center. It is open to the public November 18 to 27.